And now the end is near as the Sorcerers Supreme face the final curtain… At least, that’s how it seems as Time After Time begins with Isaac Newton, reading from one of the most powerful books in creation, The Word of God, and attempting to summon the “creature” responsible for writing said book. Engaging in his suicidal spoken word act in the middle of Central Park attracts more than a little attention and as the combined forces of the Sorcerers Supreme and the Avengers attempt to stop him, the author whose attention Isaac has been trying to get, appears. Which rains on everybody’s parade, as the Lovecraftian monstrosity from way out in space and beyond time becomes absorbed by, and obsessed with, reclaiming its tome, burning the world to cinders and snuffing out any and all “Earth Meats” who get in its way. 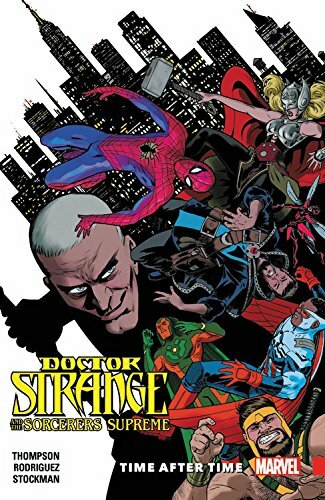 As opening chapters go, Robbie Thompson’s Time After Time takes some beating and the further into the story you get, the better it gets, as it throws Howard the Duck and Stephen Strange’s team together in a pan- galactic, trans-dimensional battle between science and magic with the fate of billions of lives at stake.